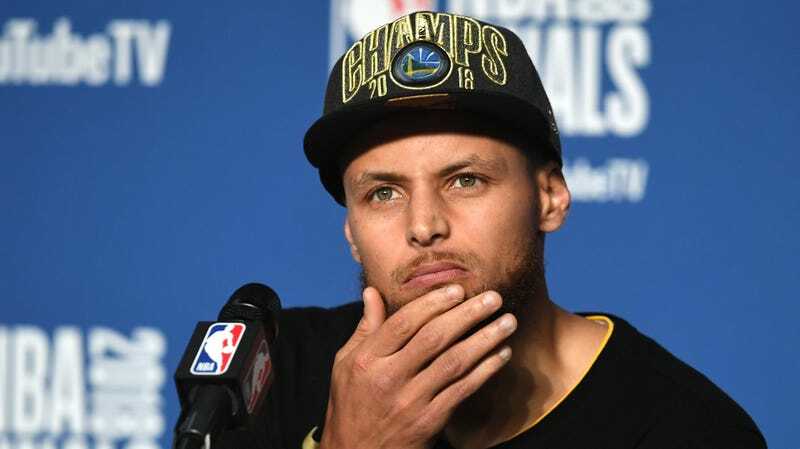 A galaxy-brained NBA Reddit user posed a reasonable question this morning: Why can’t four Golden State Warriors link arms in a circle around Steph Curry, so that no defenders can get near him to contest his shot? These are the types of visionary ideas that will revolutionize the sport of basketball. Unfortunately, I can see some problems with what I am calling the Ring of Protection technique. First of all, the Ring of Protection can’t move with Steph, or it’s rather clearly not just one moving screen, which is an offensive foul, but four moving screens, which is four offensive fouls. Now, the Warriors do a lot of moving-screening as it is (this is both annoying and smart, like how the Seattle Seahawks, during their peak defensive years, figured out how to weaponize NFL referees’ preference for not calling pass interference and illegal use of hands penalties on literally every down), but I don’t think even they can get away with having four-fifths of their lineup performing a coordinated group offensive foul all at the same time in the same place. So the Ring of Protection can’t move. Which probably is fine: Just set it up at the top of the key and let Steph bomb away from there, right? Well, hm, maybe not. The next challenge is how to separate Steph from his defender so that he can get inside the Ring of Protection without bringing an opposing player in there with him. Like you can’t just have the other four dudes stand in a ring and open a door for Steph to enter, or his defender will be right on his hip and the effort to slam the door on the defender will be... an offensive foul. But if you don’t slam the door behind Steph, then he will just be trapped in a very small space with a pesky opponent, like a cockfight. That’s no good. Deadspin Math Friend Kyle Wagner, with whom I discussed this idea this morning because we are insane dumbasses whose brains dissolved to mush the moment the 2017-18 NBA season ended (so, like, in July of 2016), proposed that the Warriors would have to disguise the action as a double-screen at whatever spot on the floor they wanted the Ring of Protection to form. Steph would cut toward the double-screen from one side of the floor, and then just as he curled around the pair of screeners—scraping his defender off on those two stationary bodies—his other two teammates would have to arrive with perfect timing from the weak side, to quickly circle around him and lock arms with the first two screeners. Voilà: a Ring of Protection around Steph Curry, who can now bomb away. The problem here isn’t whether this would work or not. (Although you can imagine that after no more than a couple repetitions of this, an opposing defense would figure out to have a defender hedge the double-screen and wait to claim squatter’s rights to the nascent Ring of Protection.) The problem is, well, if the double-screen works—if it provides Steph with the space he’d need in order for the rest of the Ring of Protection to snap shut around him without committing any offensive fouls—then he’s already open, and doesn’t need the rest of the Ring of Protection to arrive before he can fire off an open shot. In that case you’d probably rather have those other two Warriors, like, waiting down by the basket to fight for offensive rebounds, or something. So yeah, the Ring of Protection probably isn’t the disruptive basketball innovation that will maximize various Warriors’ abilities and revolutionize the sport. But what is? One possibility is to have Steph ride around on somebody’s shoulders, piggyback style. Assuming that the rules will not treat Steph and his mount as one extremely tall basketball player, but rather as two basketball players (the rulebook is unclear on this point), a drawback to this plan is that it will eliminate the tactical cost of double-teaming Steph, since the theoretical unguarded fifth Warrior will be directly beneath Steph and not, say, cutting toward the hoop. Also you could imagine dribbling being a problem, if the double-man is permitted the use only of his upper set of arms. On the other hand, good luck contesting the shot of a dude who’s releasing the ball from like 11 feet above the floor, buddy! Plus, it’s very unlikely Steph would ever twist his ankles with them dangling way up there in JaVale McGee’s armpits. He could even do sick dunks this way. Part of what makes Steph a good candidate for this move is that he is relatively slight for an NBA player, whereas there are other NBA players, some of them his teammates, who are very large and not good at shooting. This opens up an even more intriguing possibility than having Steph ride around on the shoulders of one of them, though. A way to leverage Steph’s slightness and delicate shooting touch, and the tremendous upper body strength of, say, David West. What I am getting at is, throw Steph toward the basket from beyond the three-point line, like a human javelin, and then he can just drop the ball into the hoop from above, real easy-like.